Welcome to the June Tarot Blog Hop. For the theme of this hop, Aisling, our fearless wrangler, pointed out that just as the Oak King, Cernunnos (the Green Man), god of planting and the Waxing half of the year, is part of his opposite, Lugh, the Holly King (the Red God), god of harvest and the Waning part of the year, both being halves of a whole, so too are each of us comprised of two halves, a light and a dark. Aisling wrote, "It is important in the understanding of this Lore to realize that the two Deities here represented are actually seen as one God, two Faces of the same Being, two aspects of life, and actually perform the combat between Oak and Holly as a necessary adaptation of their own Being, with the full understanding of the necessity of both a waxing and a waning year, planting and harvesting, and the joy of creation connected with the necessity of using that creation." Likewise, she noted that it is important for us to understand the duality of our own natures. 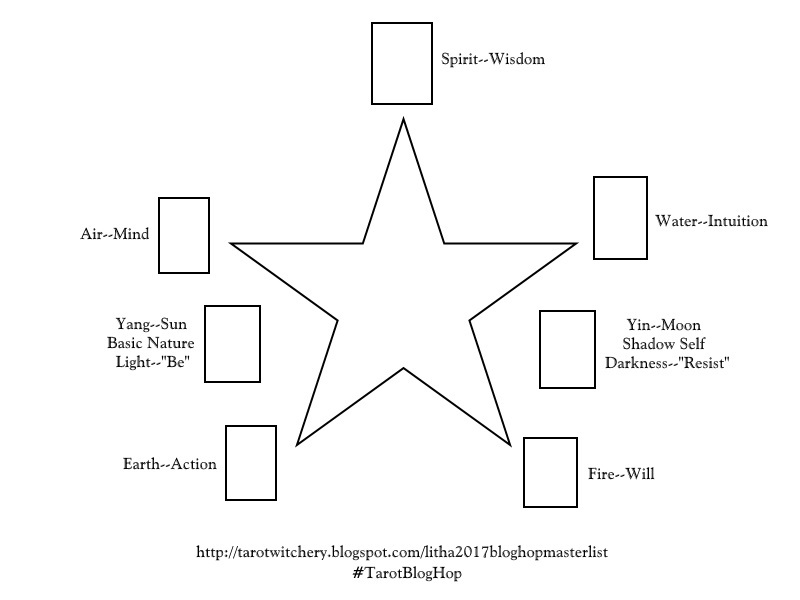 Yang Yin Tarot Spread TBH June 2017. Towards developing an understanding of this duality, she instructed us to pick a card to represent ourselves, our fundamental nature--our being. Then we were to choose a card that represented its "cognate opposite"--"the yin to our chosen yang." After that, we were to draw five cards at random, to represent the elemental energies in our lives, and to examine how the light and dark of our natures interacted with these forces. Deck used: The Secret Tarots--Marco Nizzoli (Lo Scarabeo 1998). Picking the Yang card was actually hard for me, mainly because I was faced with so many tasty options. 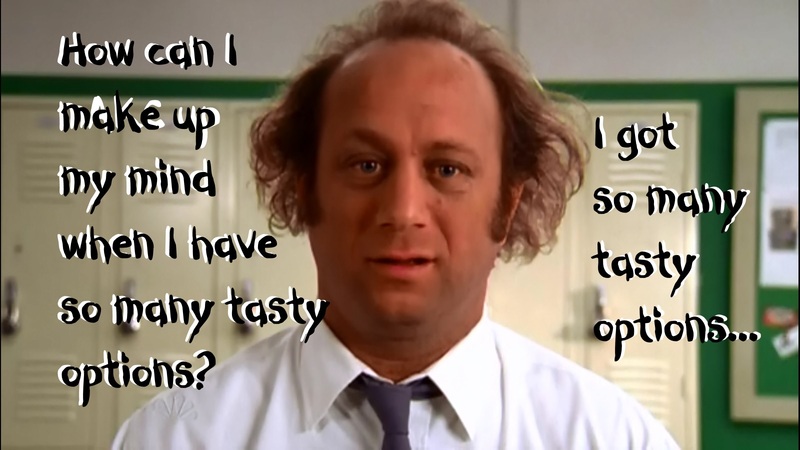 Literally, I quoted Jeff from the cult TV show, Chuck--"How can I make up my mind when I have so many tasty options? I got so many tasty options..." which probably says that I need a more nerdy Tarot deck than the one that I am using. I have always found it easier to see the darkness in myself than the light. Think of me as a Yin Yang Peppermint Patty--the dark is all visible with the light part all hidden away. 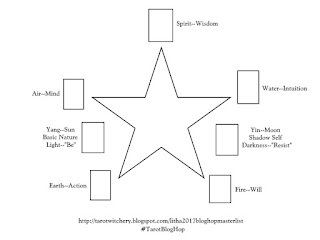 For those who are curious, "Yin Yang Peppermint Patty" is a saying that I learned from my Gardnerian Wiccan aunt--it was the first thing that went though my mind when I read the theme of this Tarot Blog Hop. The ease that I have in seeing the darkness in myself explains so many of my magical mottos--most of which can be summed up as "If I am a villain condemned to hell, I just as well have some fun on my way there." Part of my problem with picking a Yang card is spiritual pride. For instance, I would love to be able to choose the Magician card as my Significator--after all, I am an occultist involved in using magic for spiritual development. But realistically, I am probably more of the Devil than the Magician, for as a ceremonial magician, I tend to beat on the universe with a large stick until it does what I want it to. This is a perfect illustration of a magician having a large ego--my only saving grace is that I know that I lean towards black magic, and can't be bothered to claim otherwise. 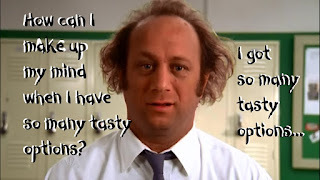 Sadly, I am just like Jeffrey Barnes from the cult TV show, Chuck. In the end, I went with the card from my favorite Tarot deck that everyone associates with me: Four of Pentacles. In this particular Tarot deck, The Secret Tarots (Marco Nizzoli), the Four of Pentacles is represented by a man sitting next to a desk with an orb lamp, ink bottles, paper and a book--in other words, I think he might be a writer. (Or I could be wrong, and he could be the miser of the Waite/Smith/Rider deck--in which case, I grew up in a poor family and being cheap is a virtue--or so, my mother believed.) Ironically, in my mind, writers are magicians--this is just a more realistic version of a magician. And as my regular readers know, I fancy myself as a writer. When I read the theme for this hop, I instantly knew what my Yin card was--the Eight of Swords. And I do mean that I knew instantly--there was no need to think about it any further. Like my Yin card, this is a more realistic version of a Major Arcana for me--yes, I can see the Devil in this card. In my case, my darkness is a mental state created out of being bipolar, being raised in a bipolar family, and being expected to sacrifice myself in the best interests of everyone else, and to only do things that made the rest of family (well, my mother) look good. Or as I like to joke, the voices in my head can get really loud. "Will this project make money? Shouldn't you go back to flipping burgers--you would make more. Ain't you full of sinful pride? You are a lousy writer. It is your sister who is the real writer. What would Mom [and the rest of the family] think if this project became successful? Oh, the shame you are going to cause--the family is going to disown you." Basically, I am a prisoner in my own mental hell constructed by an unstable selfish bipolar mother. How unstable and selfish was my mother? Oh, just the normal "Babysitting your siblings is more important than your homework" and "Oh, I am having a bad day, so let me throw you down the stairs" and "Oh, he doesn't visit me because he ended up in prison" and "Oh, you are a Wiccan...well, I am going to try to get you committed to a mental ward for being a Satanist." Never mind that I never served a day of jail time, and that I successfully managed a restaurant for ten years, and completely ignore any kind act you have seen me do. Is it any wonder that I can see my darkness much better than my light? 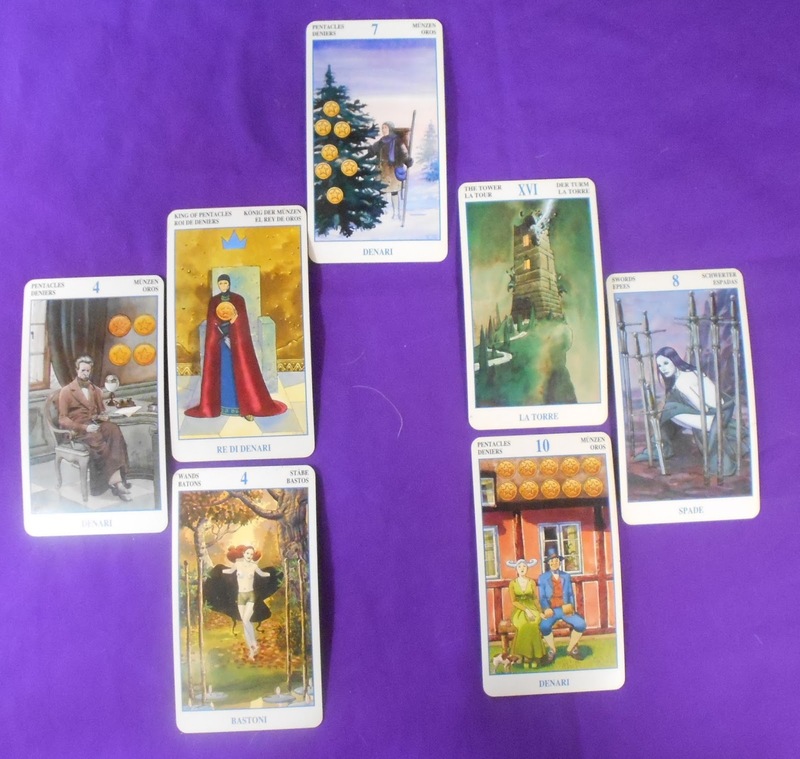 The Spirit (Wisdom) card I pulled was the Seven of Pentacles, a man looking at a growing tree. In my head, I have all these perfect plot ideas...which I tend to give up on before I am even remotely done with a project. Pat Zalewski (or was it his wife, Chris) said of this card that it sometimes indicates "There is a strong need to be financially secure to offset a deep emotional need for security" and that is really part of my Stop and Go problem as a writer. I can quickly get off the rails, and start project hopping (finishing nothing) when monetary shortfalls crop up--all in the hope of finding that golden money making project. The Water (Intuition) card I pulled was the Lightning Struck Tower. On one hand, I hope to be a successful writer; on the other hand, I fear becoming a successful writer. Basically, I have some fear of being successful. While my mom died two years ago, I still think that some of my family will blow a gasket if I actually do become successful. 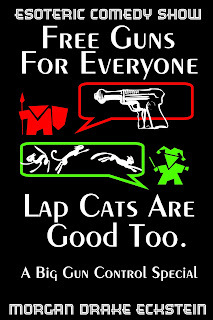 And let's be honest, all writers end up with a horde of haters. On top of that, I would have no idea what to do with actual money, if I somehow ended up being one of those writers. Fortunately, as the voices say, I am a little delusional and can ignore the possibility of becoming successful. The Air (Mind) card I pulled was the King of Pentacles. This is an one day at a time card--just keeping moving forward. The writer in me knows that writing projects take time to complete--there is research, rough drafts, beta readers, editing, etc. to do. And the crazy voices say, "Just one more day--then tomorrow you will give up and go do something else with your life, and everyone will be happy that you finally woke up to your senses." The Earth (Action) card I pulled was the Four of Wands. This card reminds me of my wife. And to be honest, it is her income that is allowing me to stay at the table and continue to write. She is also the person who described to my doctor in horrific details the way that I was acting as an untreated bipolar--without her description, I would not be on the meds that I am currently taking. In addition, there is a "take joy in life" aspect to this card--"nothing ventured, nothing gained" says the writer; "have fun while you can" says the voices of doom and despair. And so we reach the end of a reading that I am quite sure makes me sound like a loser, who is just one prize away from a Cracker Jack box. I would like to think that my display of public insanity makes you feel much, much better about yourself--or at least grateful that you are not me. And if not, just smile and say, "Yin Yang Peppermint Patty" to the next ten people you meet because that always cheers me up. I will definitely be saying yin yang peppermint patty to people today and might even leave it as a comment on some blogs! Thanks for your stories. Yeah, mental health has a way of running - er, galloping - in families. The gift that just keeps on giving, huh? I struggled with mental illness for years - still do, in fact. I joke that it's like being a mutant from the X-Men comic where people discover their mutant powers when they're teenagers. Turns out, my mutant power was to feel unwell on a cyclical basis LoL I learned to ride the lighting, I suppose.